Coming from Sourp Magar, take a left at the T-junction near the forest station, then a few minutes later another left to turn onto the road to the Alevkaya North Cyprus herbarium, a little museum of 800 local plant specimens pressed or preserved by Dr Deryck Viney, an expatriate resident of Karmi. It is open from 08.00 until 16.00, and was a project aided by the Forestry Department. For Antiphonitis, continue past the herbarium and down the hill on the winding forest track for 8km until you reach a junction at a bend in the road where a dirt track heads off right. A signpost points out that this is the way to Antiphonitis. Follow this picturesque track as it winds and climbs for some 6km until it reaches a huge incongruous electricity pylon. Straight on is unsignposted, as is the smaller track that drops steeply downhill to the left of it, and it is this latter track that will lead you directly down to Antiphonitis, nestling below in a fold of the mountain, its red-tiled dome protruding unmistakably from the surrounding green. The steep track is driveable with care in a saloon car, unless there has been recent rainfall, but if you prefer to walk, it will take only 15 minutes. Open daily from 09.00-16.00, this is the only monastery of the three with an entrance fee which goes towards the upkeep of the monastery and the provision of facilities (cafe and toilet). 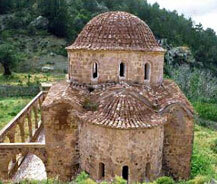 Architecturally, Antiphonitis is of far greater merit than Sourp Magar, and the lovely Byzantine church, centre of the monastery until 1965, dates to the 12th century when it was built by a monk from Asia Minor. The porch and graceful Gothic loggia (open arcade) were added in the 15th century under the Lusignans, and inside the derelict shell you are staggered to see exquisite frescoes still preserving their colour surprisingly well. It was in the wall paintings of such tiny rustic churches, tucked away in remote places, and often financed by private donors, that Cypriot Christian art achieved its own distinctive style, and such frescoes are today their finest legacy. The dome reveals itself, on close examination, not to be a perfect circle, but its disproportionately large size gives it fine acoustics, if you fancy a bit of chanting. Appropriately, the name Antiphonitis means, loosely translated, Christ who Responds. High up in the dome is the lovely deep blue background of the Christ Pantokrator, and on the south wall is the unusual Last Judgement scene, both from the 15th century. In the southwest corner are the main, early 12th-century frescoes. In recent years two professional attempts have been made, probably by locals under the instruction of international art dealers, to steal sections of these frescoes. These two sections can be identified quite clearly, squares of about half a metre each way, cut into the walls. One of the attempts failed, and the cut-out section crumbled, disintegrating into pieces on the ground. The other is now probably part of a private Byzantine art collection in some distant part of the world. From Antiphonitis you can, if you are based in Gazima?usa, take the forest track eastwards from the pylon for 500m to reach a further crossroads at which you continue straight on. Some 300m later there is yet another junction, and from here you can fork to the right, downhill some 6km to reach the village of Tirmen where the tarmac begins again. This dramatic descent can be driven with care in a saloon car, though the villagers are generally rather startled to see visitors approach from the mountain heights. If you are based in Girne, the more likely return is back down on the northern slope of the mountains towards Esentepe. Returning from this direction, you may spot, about halfway back along the forest track, the forlorn little red dome of a derelict Greek church, overgrown with scrub, with no apparent way to it.